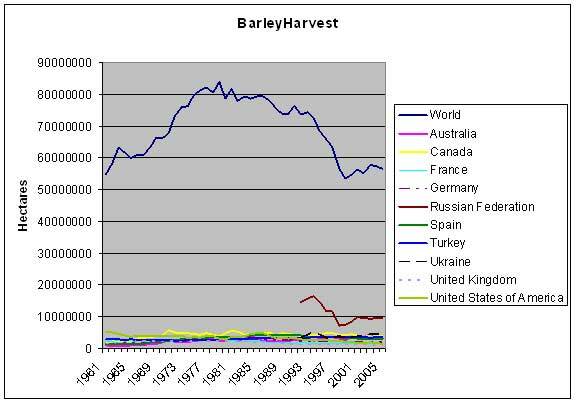 The graph on the top left (Figure 1) shows production of the top barley producing countries in 2005, and their percent contribution to the world production. The world map on the top right shows all 2005 barley production records from countries across the globe, (color-coding according to their production is consistent across all Gramene species pages). Below left (Figure 3) is a graph of global barley production from 1962-2005, and the graph to the right of it (Figure 4) reflects the land area used for that production. Yield/Hectare has increased during this time period. Barley has a wider ecological range than any other cereal because it is more adaptable than other cereals, tolerating many diverse environments except for acidic and wet soils (3, 6, 10, 12, 13). Barley can be grown on soils unsuitable for wheat, and at altitudes unsuitable for wheat or oats (3). Because of it's salt and drought tolerance another attractive trait is that it can be grown near desert areas (3, 13). Barley is certainly a staple grain for many animal feeds or in many countries, but it's importance for malt beverages is a cultural factor that contributes to its significance in certain areas (10). World Barley Production from Geohive. Barley Germplasm Database, 2003. Barley Database Notes. Barley Germplasm Center, Okayama University, Japan. Barleyworld.org. 2005. The Barley project, Oregon State University. What is Barley? Accessed April 19, 2006. Hordeum vulgare. Retrieved April 18, 2006, from the Integrated Taxonomic Information System on-line database, http://www.itis.usda.gov. Kling, J. 2004. An Introduction to Barley - Notes from CSS 330 World Foods Class. Accessed April 18, 2006. Plants for a Future database. 2004. Hordeum vulgare Blagdon Cross, Ashwater, Beaworthy, Devon, EX21 5DF, UK. Website: www.pfaf.org. Accessed April 18, 2006. Small, E. 1999. New crops for Canadian agriculture. p. 15-52. In: J. Janick (ed. ), Perspectives on new crops and new uses. ASHS Press, Alexandria, VA. US Barley genome project. 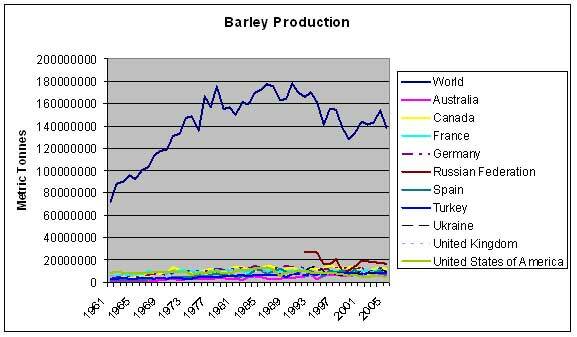 2005. http://www.barleyworld.org/northamericanbarley.php Accessed April 18, 2006. U.S. Grains Council (2006) Barley: Genus Hordeum, family poaceae, a cereal grain. USDA, NRCS, 2006. The PLANTS Database, 6 March 2006. National Plant Data Center, Baton Rouge, LA 70874-4490 USA. http://plants.usda.gov/java/profile?symbol=HORDE. Young, B. 2001. Barley; The Versatile Crop. Southern Illinois University, College of Science, Ethnobotanical Leaflets.